The census report I have linked shows Muslim population has grown by 24% during 2001-2011 while Hindu population has fallen below 80%. In terms of numbers that would mean Muslim population is around 18 crores. Average unemployment hovers between 5 and 9% in India. But in case of Muslim youth, the unemployment is as high as 18% which includes educated ones. Take these figures as indicative. The highest Muslim population growth has been in states like Assam, Bengal and Kerala which is hardly surprising. We also don’t know if all the “illegals” in Bengal, Assam, NE overall or in Maharashtra or Telangana are included in the census. In Assam, Bengal and Kerala the Muslim population has crossed 25%, J&K doesn’t need a mention as it is way above 65%. The top 10 countries in the chart above are all facing Islamic strife, especially countries in Europe. 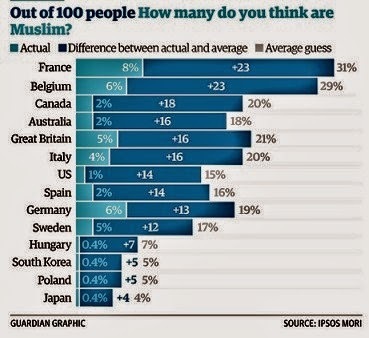 France has the highest of 8% Muslim population and they have seen frequent attacks on Jews, intimidation, street violence and the Charlie Hebdo killings. And they are 8% in a smaller country and we are 14% in a country which has a history of communal violence. Some are worried the Muslim population will equal or exceed the Hindu population some day in the future. So people like Sakshi Maharaj want Hindus to have more children and others are doing a “GharWapsi” campaign. The problem is not the danger in Muslim population exceeding Hindus because it doesn’t have to wait that long for serious trouble. Kashmir has shown what can happen. In Assam, Bengal and Kerala we have seen what just about 25% can do. Economic progress and success depends on social harmony. Our imprudent politicians partitioned this country but even in that they left the job incomplete. If partition was based on religious grounds then it should have been complete. It is inevitable that the violence and strife similar to what we are seeing in and from Pakistan are invariably going to infect states like Bengal, Assam and Kerala. A slow but sure ethnic cleansing of Hindus, like that in Kashmir, is inevitable. In Mumbai there are pockets of no-go zones. Mumbra and Malegaon are Islamic zones. Peace in Gujarat has come after extreme retaliation by Hindus but even that isn’t guaranteed any permanence. Any state, village or town that reaches 10-25% of Muslim population is in for strife. It is not imagination; it is a proven mathematical fact of numbers. Some of our politicians and most of our media crooks like and cover up for Muslim crimes. Maybe their funding compels them to do so. Many of these crooks, like Mani Shankar Aiyar, come from the Commie hotbed of Cambridge. Yes indeed, most people don’t know that Cambridge is a Commie den just like JNU is. Of course, Jawaharlal Nehru too was soaked in Cambridge, so were Rajiv and Rahul Gandhi. It is a stunning fact that most of Britain’s anti-national spies and traitors came from Cambridge. The notorious five are known but there may be many that weren’t discovered or found. Same is true for India. And it is not as if Oxford is a saint, they too have Marxist clubs. So the Macaulay Putras and Putris in our media who forever hate and abuse Hindus have a background and indoctrination in Commie-love and Hindu hatred. And usually, the Commies in India prefer Islamic ideology because it is quite similar to theirs – hating Hindus being the consequential practice. These crooks in media and politics shouldn’t be tolerated and must be shamed every single day of the rest of their lives. “In France, Britain, Germany, America and nearly every other country in the world it remains government policy to say that any and all attacks carried out in the name of Mohammed have ‘nothing to do with Islam’. It was said by George W. Bush after 9/11, Tony Blair after 7/7 and Tony Abbott after the Sydney attack last month. It is what David Cameron said after two British extremists cut off the head of Drummer Lee Rigby in London… In private, they and their senior advisers often concede that they are telling a lie. The most sympathetic explanation is that they are telling a ‘noble lie’, provoked by a fear that we — the general public — are a lynch mob in waiting. ‘Noble’ or not, this lie is a mistake. First, because the general public do not rely on politicians for their information and can perfectly well read articles and books about Islam for themselves. Secondly, because the lie helps no one understand the threat we face. Thirdly, because it takes any heat off Muslims to deal with the bad traditions in their own religion. And fourthly, because unless mainstream politicians address these matters then one day perhaps the public will overtake their politicians to a truly alarming extent”. The day is not far off in India when non-Muslims overtake their politicians to a truly alarming extent and retaliate. It is therefore better to sound the warning now than repent later. Narendra Modi claiming youth population being an asset is only partly true. The Imam of Brooklyn has shown the courage to say “We Muslims are a time-bomb and hate Christians”. In India, replace Christian with Hindus and the situation is no different. On the contrary, in India Muslims and Christians unite in their contempt for Hindus. The recent episode of Jayanthi Natarajan has shown how many Christian NGOs have thwarted India’s economic progress to serve their western masters. The Commie media, politicians, Bollywood, print magazines have all made it mandatory – the more educated a person is, he or she must demonstrate it by slamming and abusing anything that is Hindu or related to Hinduism. These cowards claim Barack Obama’s reference to Article 25 and freedom of religion was an indicator to Modi and the Hindu parties for tolerance. Morons! The same Obama went to Saudi Arabia next and many Americans are asking why he didn’t make a similar statement there. You see, cowards lecture Hindus (who are already excessively tolerant) because they know they are tolerant and will not retaliate. Try doing that in Pakistan or Arabia or elsewhere, it is unlikely you will remain one piece for long. Beyond a point tolerance is not a virtue; it morphs into cowardice and self-destruction. Let me paint an extreme picture. What if some Hindu gangs too armed themselves with bombs and AK-47s? What if in their anger they bombed or killed some abusive Bollywood movie-makers? What if they bombed the offices of the Hindu-abusing NDTV? They will outrage, condemn and shout that it will not stop their freedom of speech. But let me assure you the cowards will go into a shell and you will not see much abuse for long and continued violent attacks on them will stop the abuse. And that is the fear that Islamists have planted in them. That is why they wet their pants and skirts even mentioning the crimes of Islamists and keep parroting it’s a “religion of peace”. If such an extreme outcome happens would the same media morons and political hypocrites chant “NDTV had it coming” or “the director and actor had it coming” like they do for Charlie Hebdo? But, unfortunately, some do have it coming as constant clashes in Bengal show. Tolerance is over-rated and no one should ever suffer or be killed for being tolerant but history shows only the tolerant are killed. Some scary stats those! I shudder to think what would be the future of our country if the religion of peace is allowed to grow beyond 20%. For long, there was nobody to tell these things. But at least now we have people like 'media crooks, 'Niti Central' etc. who are articulate and confine to facts and figures (as it should be) to tell their views that are not print garbage. The readership on these pages shows that lot of people are getting interested and this is first step. Let us have hope! Hi Nanadakumar (and anybody else) if you come across any other Web site like Mediacrooks and Niti Central, please let us know. Thank you. Another site is 5forty3.in to watch for good analysis, good work Ravi, keep going strong, new generation will be indebted to you for the awareness and Truth you are equipping them with. One of the most important things that is not being done is finding out the local support for Pakistan-origin terrorist attacks. In 1993 riots in Mumbai, the police hit back very hard at the rioters and since then there had been relative peace there. There used to be very frequent riots in Bhiwandi etc. before that. However 26/11 and the Azad Maidan incident saw the regrouping and reemergence of Islamic violence. Whereas in 1993, the police decisively attacked the Muslim mobs and brought back peace for a long time, we saw total police inaction during the Azad Maidan incident. This shows that perhaps the tentacles of the terrorists have reached and affected how our police works. It is great to blame Pakistan for all the attacks, but even more dangerous is the local support that Pakistan must surely have, to carry out these attacks successfully. I hope Modi's government is at least carrying out covert operations to find and eliminate the Indian support for Muslim terror. If the will is there administratively it is simple. One rule for all , No reservations . start with MP, MLA . Ambedkar was a dalit . He made it to the top revered . Many dalit saints still worshipped why can't others. How is US making it . Strong attack on criminals Disproportionate retaliation - & your broken window tircks. Likes of Abdul Qalam & many others to come out ,call a spade a spade. Nonsense of discrimination theory of likes of Javed Akhtar. Does b/wood take others without reference or personal liking . Govt adds & revenues to stop to the distorted media & favour to the nationalistic media. Social Media is not enough. Sir, I am an avid follower of you @mediacrooks account .. But unfortunately for some reasons you have Blocked me without citing any reasons. My guess is I had mass-tagged you in one or two pics and that is the reason.. Sir, it would be gracious on your part to reconsider your decision and I promise I won't repeat my mistake .. These 3 parts discourse should be enough to convince those tolerant brigades and other anti Hindu media brigands to come to their senses. Whether Anti-Hindu Congress and other assorted secularists agree or not it is alarming that the population percentage of Hindus are rapidly declining. Considering what has happened to Hindus in Pakistan, Bangladesh and even in our own Kashmir Valley it sends a warning signal. Secularists have problem only when some Sakshi Maharaj exhorts Hindus to have 4 children. When such things happen in reality with some communities, they don't have any problem. Some Christian Priests have offered incentive for 5 children or more without any outrage from the so called Seculars. When Justice Krishna Iyer commission made some recommendation on two child norm the outrage was beyond imagination (In Kerala). Where they have dumped the report containing the recommendation nobody knows.Read this in The Hindu "Population: the state and the Church " Do these secularists want Hindu population should be made to decline at a faster rate ? What is the hidden agenda? Who are the vested interest people behind it? Why the double standards towards Hindus? The Secular govt. has even denied Hindus their right to maintain their temples by taking them over? What business a so called secular govt. in administering temples? How anybody whether Hindu or not, who is elected by people of all religions can have say in the administration of temple? 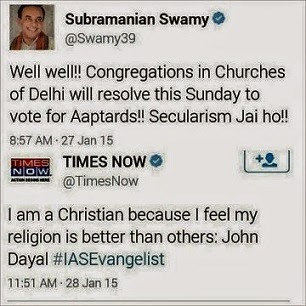 The secularists have opposition to "Ghar Wapsi" too. It is also a voluntary conversion. When propagation and conversion is allowed in the constitution why they object to it. Is there a provision in the constitution that conversion towards Hinduism is prohibited. Otherwise let us prohibit all conversions (which is not agreeable to the conversion mafia and their supporters the so called seculars). Hindus should bear the cross of secularism even if they go down with it. Hindus should always chant "All religions are equal" but in fact some are more equal than others. Hindus are expected to tolerate everything even if they insult our symbols like ":Saffron" terming it as "Saffron Terror". Such is the hate. I would have remained hand in hand with the so called SECULAR people if they would have at least cried for the 59 persons roasted alive in Sabarmati Express at Signal Falia, Godhra (they brought in a self-combustion theory to insult the victims), cried for the Kashmiri Pandits who are ethnically cleansed from Kashmir valley and found an immediate solution the way they beat their breasts for the Palestinians etc. &so on. They made me to conclude that being a Hindu I am of no use to them for their scheme of things. Very well explained. It is a scary situation. With 14% and growing, don't know how India will tackle this situation. I think a special army regiment must be raised to combat Naxals inside India. This regiment must be exclusively for minorities and 100% reserved for them.As it is believed that the naxal menace is engineered by evangelists I guess it would be a win win situation for all.The naxals will then be more caring for their brothers in the combat force.Why should majority hindus die in combating the naxals created by evangelists. ?Moreover both desert minorities are hand in glove with each other to foil hindus. True only way to tackle this muslim population is to make every woman have 4-6 kids and whoever don't follow this rule, should be declared Hindu hater or ISIS supporter. It's about time, yes it is! only News X carried a small report on it by mentioning people of a" perticular community"
No matter how educated Muslim youths are but as long as they are indoctrinated to a victim mentality every Friday, they will not amount to anything as far as positive contribution towards society is concerned. Justifying why Muslim youths have become militants, a Muslim writer wrote that after relentless bombing by West, only thing left for these youths was their God and their religion. He was speaking for majority of Muslims. However, when these Muslim youths carry out terrorist attack, first thing they say in one voice is their action has nothing to do with Islam !! Go figure. Almost everywhere in the world, Muslims and Christians are at each other's throats, Thailand, Yemen, and in various African countries. Christians of India are stupid to think they will be treated right if and when Muslim population go over a critical point. I think we need a more aggressive set of people than RSS to tackle these threat. Great piece.